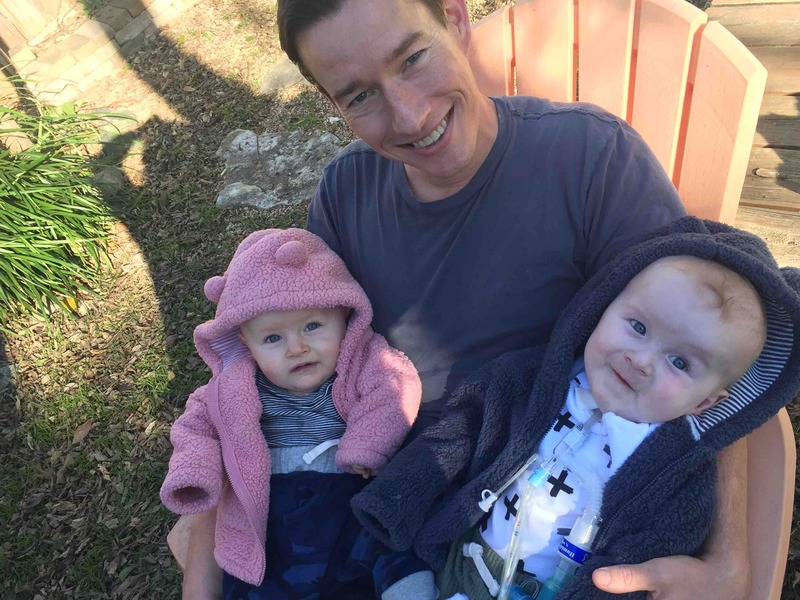 Our seven month old twins, dear Adelaide and Gray were both recently diagnosed with the devastating neuromuscular disease Type 1 Spinal Muscular Atrophy, which until less than 2 years ago, was a fatal diagnosis with no treatment. Now, there’s hope with a groundbreaking medicine which they have already begun, but our ability to get them all the care they need to have the best possible lives and mobility will be extremely costly. Luckily, the treatment for SMA (which costs $750K per child in just the first year!) is covered by insurance. However, insurance does not cover nearly enough therapy and home care to provide them with the quality of life and likelihood of progress they deserve… nor does it cover the massive amount of non-medical costs headed our way. Right now, they are getting physical therapy, occupational therapy and speech therapy, however we’re being told they only have 60 visits of therapy per year, which we will go through in the first 10-11 weeks of each year. We’re looking at an out-of-pocket cost of about $120 per therapy session for the other 41 weeks which adds up to about $24,000 per year. As of the 21st of September, our sweet Gray had to have a feeding tube due to aspirating while drinking milk or eating puree. Taking care of them fully and safely is way beyond what our one nanny can handle. 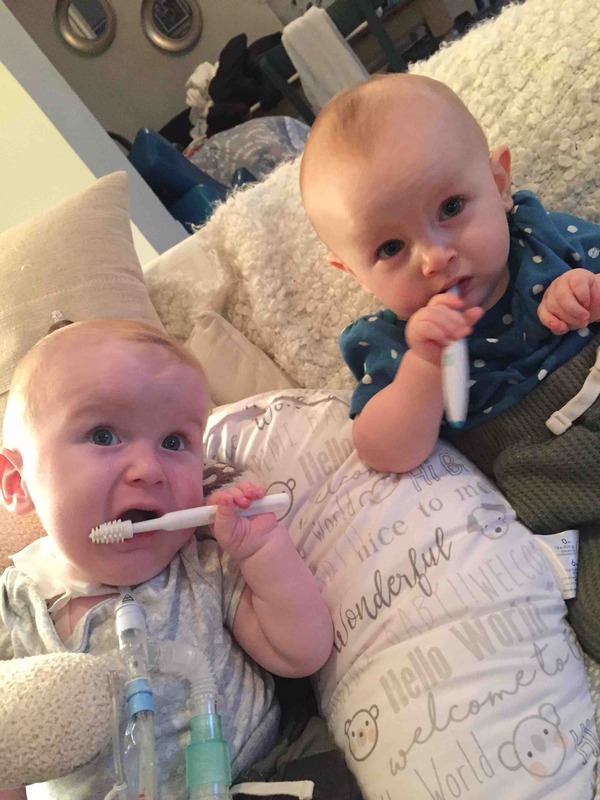 Both of our twins have very high need and we not only need two people to take care of them while we’re at work, we need those people to have a high level of healthcare training and background to make sure our twins are safe and well cared for. Unfortunately, from our initial research and feedback from social workers, there’s is little-to-no coverage for this level of home care if they aren’t on breathing support or other high-level medical support (which thank goodness they currently are not). And even IF (and it’s a big ‘if’) there’s some level of reimbursement/care possibilities via Medicaid or other programs, it can take several months to actually get that help approved. And we need that help NOW. Jenny has to work full-time for us to keep our health insurance, so I’m nearly full-time helping our nanny and it’s keeping me from being able to provide for the family financially. Our goal is to raise enough money for at least 2 years of the home care and therapies they need to not just survive, but really thrive. A very conservative estimate of that number is $250,000 ... It blows us away that this figure doesn’t even cover the myriad of other non-medical and non-covered expense we are sure to incur along the way, so every donation is very, very appreciated. These funds will always be kept in a separate account that is only used for Adelaide and Gray’s health and wellbeing. The care and therapy your donations provide will be vital for giving them the best chance of walking and enjoying an active life that most children enjoy. Finally, we truly believe that prayers, wishes, and intentions can have a powerful effect on our babies and their future strengthening and success. 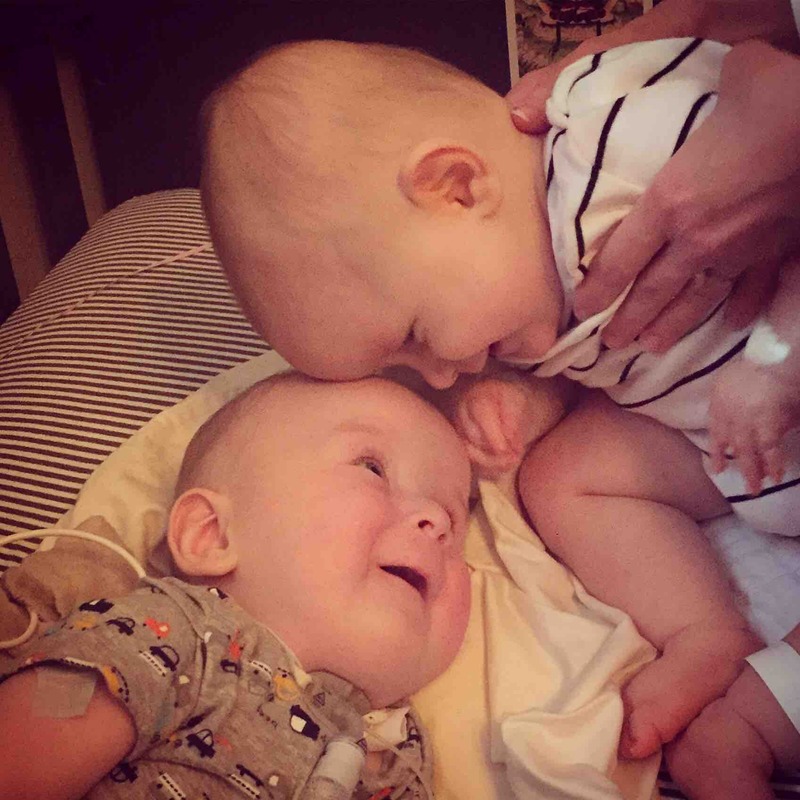 So whether you can or cannot donate financially, please donate your intentional prayers, strong wishes, and positive thoughts that Adelaide and Gray live full happy lives with the ability to walk, run, and play without physical limitation. Our deepest and most sincere gratitude to you and every single donation. 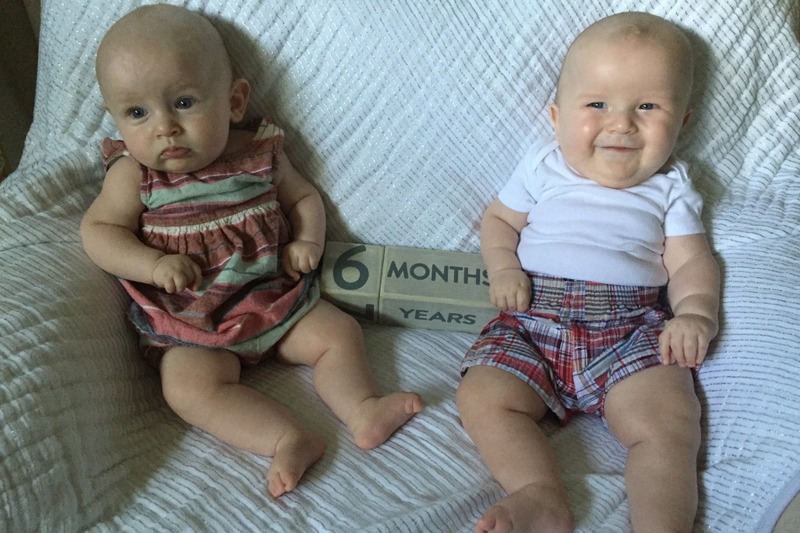 Another great report for the kiddos and we just reached three months at home after Gray’s return from the hospital! The Gene Therapy, Spinraza, and the amazing work of lots of therapists and nurses is really paying off. Gray and Adelaide both continue to show wonderful new abilities and strength. In these videos, you’ll see that Adelaide is getting stronger pushing through her arms to work towards crawling. Though we’re wondering if she might skip crawling all together because the strength in her legs when we hold her in standing is improving so quickly. Grays head control and ability to sit is improving by leaps and bounds… He has had times when he has sat over three minutes on his own, when just two months ago he couldn’t consistently hold his head up for even half that amount of time (the video here was taken just one day before his 3+minute sit ... rapid progress). We’re also realizing that we may be able to help other parents in our situation with some of the things we’ve created and our unique skills as a manual physical therapist and elementary school counselor. The third video is a training video I created for one of our therapists and for parents with children needing some spinal mobilization. 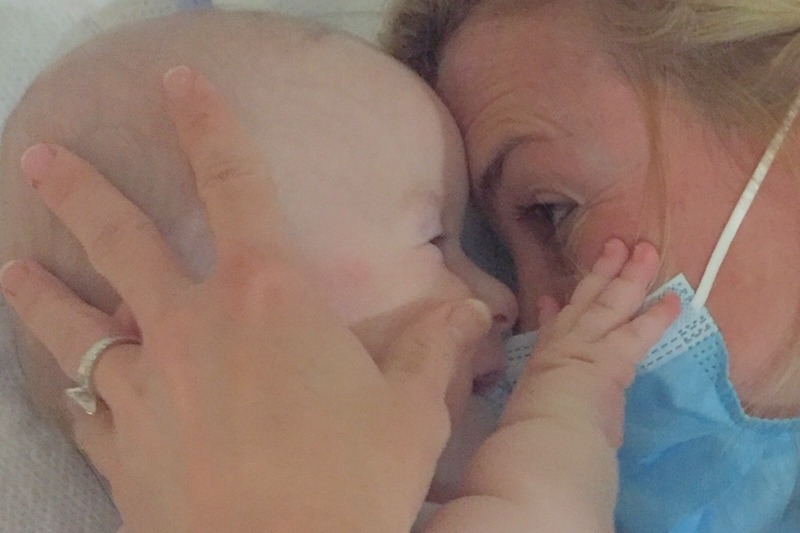 Adelaide is babbling up a storm and making new sounds all the time, and just a few days ago Gray’s lungs became strong enough to force air past his trach and deliberately make noises… The first of which was a heart melting “Dada". And it was very clear he knew what he was saying with a big smile as he looked straight at me! We finally got Gray through the final stages of Medicaid application, and Aetna has been absolutely amazing in their support so far… Providing home nursing until Medicaid kicks in, which was not originally a benefit on our insurance plan. Truly wonderful of them. However, we’ve still not been able to increase the home therapy benefit for Adelaide, so as it stands her therapies are all cash-pay out-of-pocket after about the first two months of the year. My attempt to find therapists to do a second session in the afternoon with each of them has been a little slower than I expected because that’s the time when most/all pediatric therapists are busiest with afterschool sessions. But I have managed to find them weekend therapy and Friday afternoon. 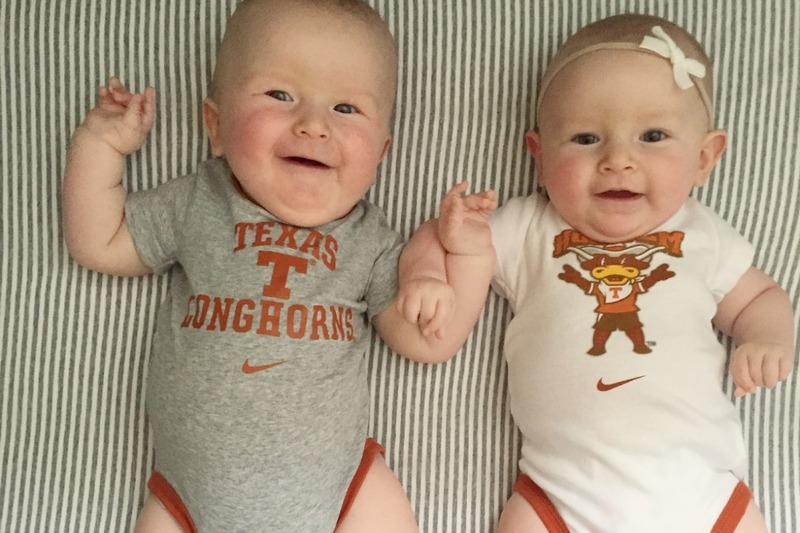 So if you know of any great pediatric therapist in Austin that would like to come work with these cuties for an hour in the afternoons, please let me know. On Friday mornings, Adelaide and Gray are once again blazing new trails with something called Neuro Feedback. I’ll give more details and some video in the next update, but essentially it is a way of training the brain to have more activity in the motor cortex. And we are currently trying to find similar bio/neurofeedback technology for their muscles, but not sure if it exists yet for infants. May have to create it ourselves. Thank you all again so very much for your generosity! Please continue to share this page as much as possible so we can fully fund all the additional therapies and care they need. Adelaide and Gray are both doing great and showing new abilities and strength every week! 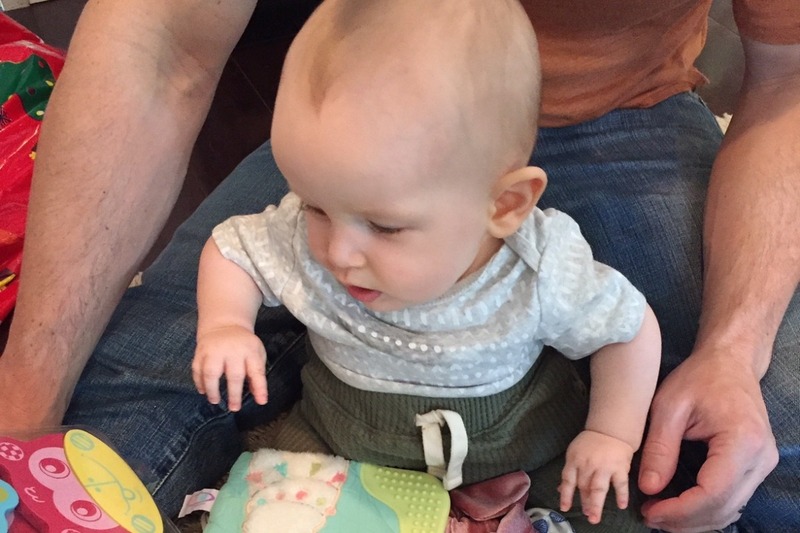 Adelaide is starting to push through her legs with assisted sit-to-stand and is now able to bounce in her bouncy chair. 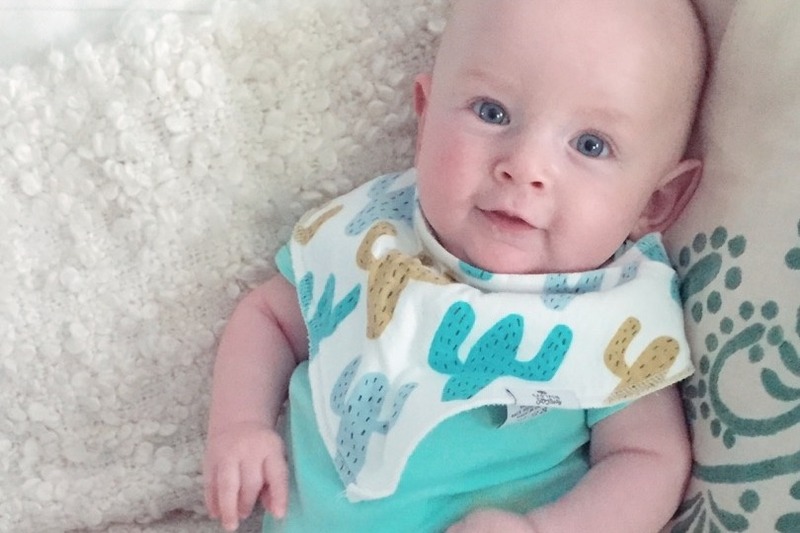 Gray’s head control is improving and he has started to roll on his own and hold his legs in the air on his back. All new developments in the past month! Life has still pretty crazy as we continue to work into a new routine at home and build out Gray’s nursing team, so it has been difficult to create regular updates here, but hopefully they can be a little more frequent moving forward. We are working with Aetna to increase the kids home therapy benefits. So far, they have been wonderful in expanding coverage to meet our needs, so hopefully it will be no different when it comes to therapy coverage. However, we know that the kids will greatly benefit from two therapy sessions each day, and that is something that not even the best of insurances will ever cover (and I know Aetna will not even be covering 365 visits each year for daily therapy). So I’ve already started to interview and hire private pediatric therapists to provide those second daily and weekend sessions. And that is where a great deal of this fund and your amazing support is going… Just as it’s named, this fund is going to help them walk someday! These updates don’t seem to allow more than one video but I’m gonna try to figure out how to add more after I post this (and if you’re on your mobile phone you might not be able to see more than one, so feel free to check it out on your laptop). Every opportunity to move is key, so I created some PT-style leg harnesses for Gray, so that he can keep his legs and arms moving even when he’s hanging out in bed for a breathing treatment. And we will soon begin experimenting with some biofeedback technology that gives immediate positive feedback when certain muscles and parts of their brain are firing. Really amazing stuff. Everything they could possibly need, they will get! Thanks to all of you!!!! At our spending rate for these necessary but non-covered treatment expenses, this fund at its current level will be depleted within about a year or two. They will need this level of treatment and therapy for many years to come, so please share and re-share this fund as much as you can. We can never thank you all enough for your support and for helping our beautiful babies. They are joyfully pushing forward and getting stronger every day thanks to your help! Adelaide and Gray turn 1-year old today and were reunited at home a couple weeks ago! What a crazy year it has been and an even crazier past few weeks getting Gray home, building a team of home-nurses, and reorganizing the house to accommodate the necessary equipment. 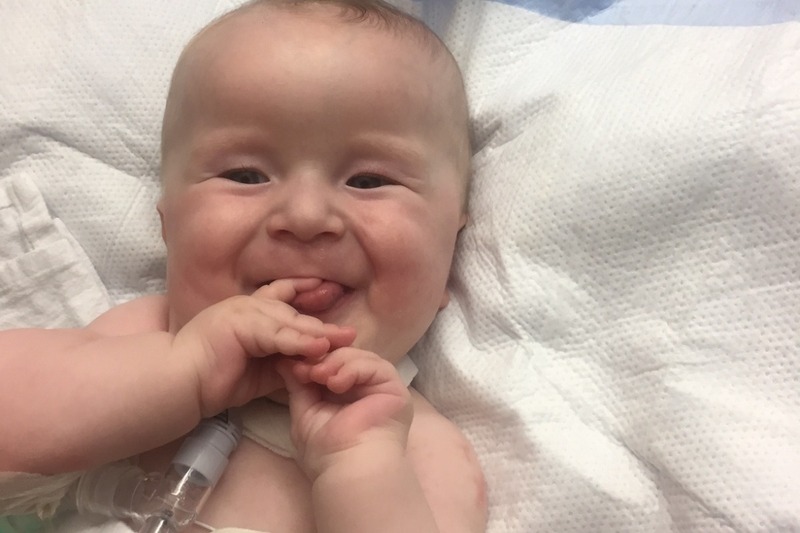 We are so incredibly grateful to have Gray back home, and as indicated in the last update, both babies received the incredible gene therapy before his discharge! It sounds like the genes can still be making their way to the right cells for up to a month afterward so please keep those prayers, wishes, and meditations happening that they make it where they're needed in the spine. We also are asking everyone to imagine them walking and playing without limitations. 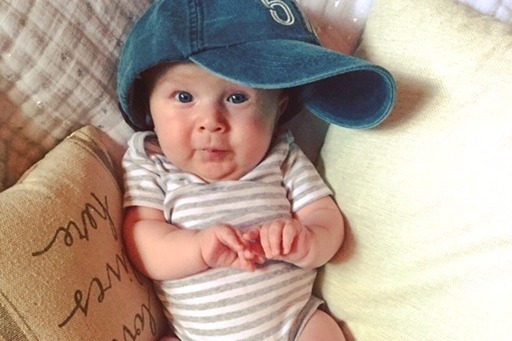 Within days of being home, Gray started to have better head control than he has ever had! Adelaide continues to amaze us and her therapists, and is starting to babble up a storm as well. We cannot possibly thank you all enough for your support! We broke the incredible $100K milestone and have you all to thank from the bottom of our hearts. Though Aetna has been incredibly good to us, there are an impressive amount of non-covered / non-medical expenses we’re already dealing with and will be many more as they grow older, so please share this campaign far and wide. Thank you again so very much! Happy new year to all! Though there are still incredible ongoing challenges, things have been going very well lately. Adelaide and Gray turned 11 months old on New Year’s Eve, and it’s blowing us away to see them grow and become more beautiful and full of personality every day. Our forever-smiley boy has done very well adjusting to his trach (breathing tube) and gastric feeding tube, and if all goes as planned we will be bringing him home within a week! He has now spent close to 3 of his 11 months in the hospital and we cannot wait to get him home. 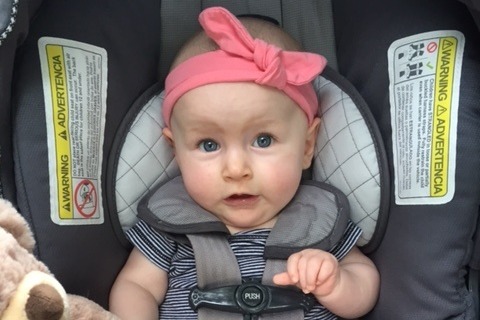 Adelaide is making steady progress with her therapies and grows stronger every day. The other incredible breakthrough is that a gene therapy company has created a way to give children with SMA the gene they are missing!... and that company has agreed to provide the gene therapy to our children for free!!! Well, the gene therapy will be free but the hospitalization and the administration of the drug will be completely out of pocket for us, as this would definitely not be a covered insurance benefit since it is still some months away from FDA approval (don’t worry, it’s already proven to be very safe). It will be crazy expensive and take a huge chunk of what we’ve raised here so far, but absolutely worth it. To the degree that the genes make it to the needed cells in the spinal cord, it will halt the progression of the syndrome and for this reason it’s being called a “cure”! 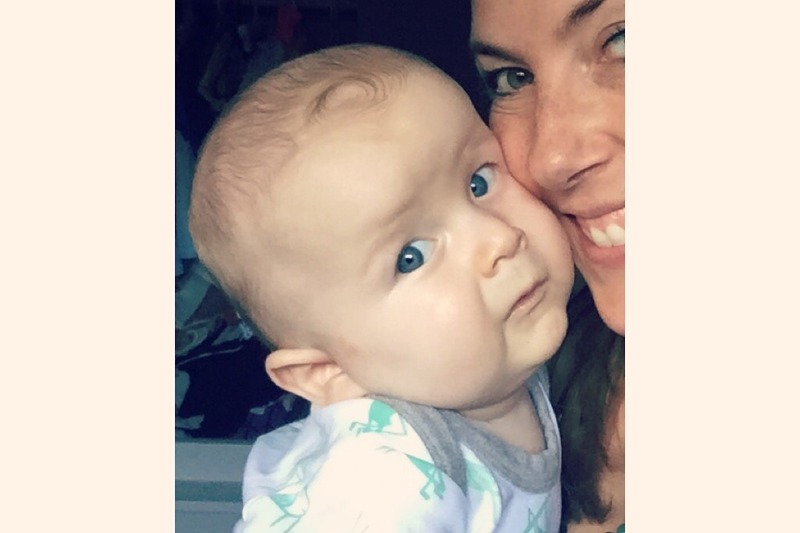 As they grow with newly-protected motor neurons, we should see some absolutely amazing progress and motor milestones not previously possible in their situation. If everything goes as hoped, they could get this treatment as early as this Tuesday. So please get those prayers, wishes, meditations, etc rolling in for them to receive it as soon as possible and for as much of the gene as possible to make it where it’s needed in the spine. We also are asking everyone to imagine them walking and playing without limitations. We cannot possibly thank you all enough for your support! We are almost at the $100K milestone .. please share and help us get there and far beyond. There are an incredible amount of non-covered expenses we’re already dealing with and will be many more as they grow older.